موریس لامارچ (اینگیلیسجه: Maurice LaMarche) کانادالی کومدین, دوبلور و اوْیونچو. ۳۰ مارس ۱۹۵۸ ‏ ایلینده تورونتو شهرینده دۆنیایا گؤز آچیب. 1980–گۆنوموز ایللر آراسیندا سینما ساحه‌سینده چالیشیب. Comic Book: The Movie Himself Segment: "Behind the Voices"
1986 Faerie Tale Theatre Mockingbird Maurice Ep. "The Princess Who Had Never Laughed"
The Transformers Six-Gun Ep. "Thief in the Night"
Popeye and Son Popeye Ep. "Attack of the Sea Hag/Happy Anniversary"
DuckTales Count Roy Ep. "Duck in the Iron Mask"
2002 Samurai Jack The Boss Ep. "Jack and the Gangsters"
The Boondocks Larry King, Donald Richards Ep. "The S-Word"
2009 The Cleveland Show Keith Leib Ep. "Birth of a Salesman"
Dr. Doom Ep. "Red Rover"
Teenage Mutant Ninja Turtles Atilla the Frog, Rasputin the Mad Frog Ep. "The Croaking"
VeggieTales in the House George the Cucumber Ep. "Larry's Cousin Comes to Town"
2015 Star vs. the Forces of Evil King Pony Head, Emilio Eps. "Party with a Pony" and "Pizza Thing"
2017–present The Lion Guard Kifaru Eps. "Ono the Tickbird", "Beshte and the Beast", "Pride Landers Unite!" 2018 The Neighborhood HandyRandy79 Ep. "Welcome to the Repipe"
Batman: Arkham Origins Victor Fries/Mr. Freeze, Cyrus Pinkney Downloadable content: "Cold, Cold Heart"
Batman: Arkham Knight Victor Fries/Mr. 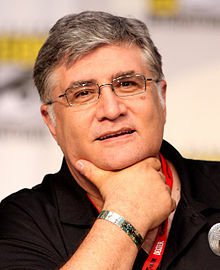 Freeze Downloadable content: "Season of Infamy"
↑ Voice Chasers: Maurice LaMarche. ↑ Axe Cop Episode THREE. YouTube. یوْخلانیلیبAugust 26, 2010. ↑ Doomed. Ultimate Spider-Man (3). ↑ Not A Toy. Ultimate Spider-Man (23). ↑ ۷٫۰ ۷٫۱ Spidah-Man!. Ultimate Spider-Man (7). ↑ The Serpent of Doom. Avengers Assemble (4). ↑ Blatant Bias: Opposite of Dream Creatures. Blatantbias.blogspot.com (February 9, 2009). یوْخلانیلیبAugust 26, 2010. اینگیلیسجه ویکی‌پدیاسی‌نین ایشلدنلری طرفیندن یارانمیش«Maurice LaMarche»، مقاله‌سیندن گؤتورولوبدور. ( ۲۲ ژانویه ۲۰۱۸ تاریخینده یوْخلانیلیبدیر). قارداش پروژه‌لرده موریس لامارچ گؤره داها آرتیق بیلگی‌لر تاپابیلرسینیز.